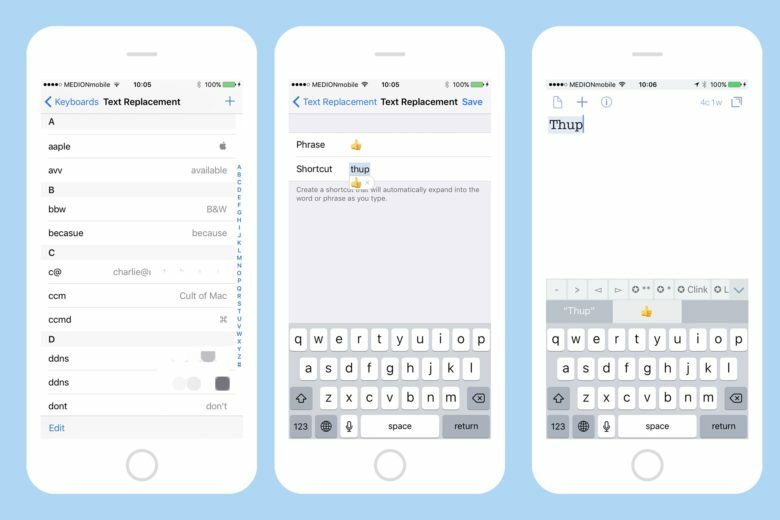 Text Replacements are easy to set up, and save a ton of time and hassle. You can even use them with emoji. What if you could type out any of your email addresses just by tapping on the same key a few times? Or do Google searches over and over on a favorite website just as easily? What about easily typing that special symbol that’s so hard to reach on the iOS keyboard that you usually never bother? All this, and more, can be yours, if only you’ll spend a minute or two setting up some text replacement shortcuts. Let’s do it right now. 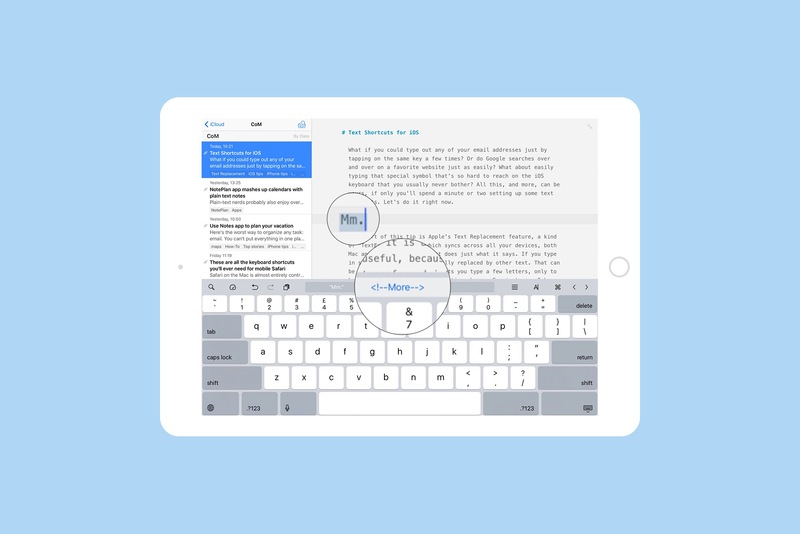 The heart of this tip is Apple’s Text Replacement feature, a kind of “TextExpander Lite,” which syncs across all your devices, both Mac and iOS. Text Replacement does just what it says. If you type in some text, it is automatically replaced by other text. That can be really useful, because it lets you type a few letters, only to have them transformed into an entire phrase. For instance, I have a whole paragraph that gives instructions for folks shipping me gadgets to review. I will never have to type out those instructions again, or search for a note to copy-paste from. I just type my “secret” word and the paragraph appears. Here are a few more examples: Custom website searches; URLs; email addresses; special symbols; HTML snippets; addresses and phone numbers; and anything else you find yourself typing more than a few times over. First, I’ll show you how to set up your shortcuts, then I’ll give some actual examples I use. And remember, even if you set these up on your iPhone, they’ll also be available on your iPad and your Mac, thanks to iCloud sync. For this reason, you don’t really want to store sensitive information in there, like passwords. You’ll find the Text Replacement settings in Settings>General>Keyboard>Text Replacement. In there, tap the + at top right, and you’ll be prompted to enter a Phrase and a Shortcut. The Phrase is the text you want to be subbed in, the long text that you’re already sick of typing over and over. The Shortcut is exactly that. Try to pick something that doesn’t occur in the middle of normal words, or you may experience some glitches as seemingly random words are subbed. You don’t just have to use letters, either. In fact, one of the best Text Replacements uses the @ symbol, as we’ll see below. Also, if you leave the Shortcut blank, the substitutions won’t be automatic, but they will show up as suggestions in the little bar above the keyboard, making them available without having to remember a shortcut. This is great for searching the Cult of Mac site while I work. I just tap the search term into Safari’s URL bar, follow it with sss, and hit return. This even works in the iPad’s Spotlight search bar, so if I’m using a keyboard, I can hit ⌘-Space, type my query, type sss, and launch the query in Safari, all in a few keystrokes. Do you have a favorite forum with a terrible search function? Try this instead. One tip: To begin with, just add a few shortcuts, otherwise you’ll never remember them. Then, as you get used to using them, add more. I have a ton of them now, but it’s taken years to get there. You’ll never have to type your email addresses again. Even if you forget how many @s are required for an address, iOS will show you your “Phrase” (in this case, your email address) in the row above the keyboard, so you can just tap the @ until the right one appears. Even better, because the @ symbol appears on the keyboard whenever you’re in a text field that accepts email addresses, you don’t even have to tap ⇧ first. Once you get used to auto-replacing snippets, it’s hard to go without. Another trick is phone numbers and addresses, although Text Replacement doesn’t recognize returns, so you’ll have to have it all on one line. And what about HTML? One of the things we have to do when we write posts in WordPress for Cult of Mac is the add the <!–more–> tag after the first paragraph. I have to type it in every post, so I made a shortcut years ago: mm. The period is important, because mm appears in so many regular words. I also have two other related categories of shortcut: Words I always type wrong, and words I hate to type. For instance, I always mistype because as “bacasue,” so I set a shortcut to fix that, using the misspelled version as the trigger. I also have shortcuts for available (avv), Kickstarter (kks), participants (pss), and more, just because I hate typing them. Finally, how about some old fashioned lazy autocorrecting? You can, for instance, set a Text Replacement to convert im into I’m , dont into don’t, and so on. There are lots of other possibilities, but like I said, you should start small, or you’ll quickly get overwhelmed and give up. Oh, and one final tip, which will blow your mind: You can use emoji in Text Replacements.